This unique recipe uses agar, a seaweed product, instead of animal gelatin, making these gummies suitable for vegetarians. Kids will happily take their Natural Calm in the form of these adorable bears. See variation in Notes for how to make Green Gummies with vegetables. Makes about 8 gummy bears. 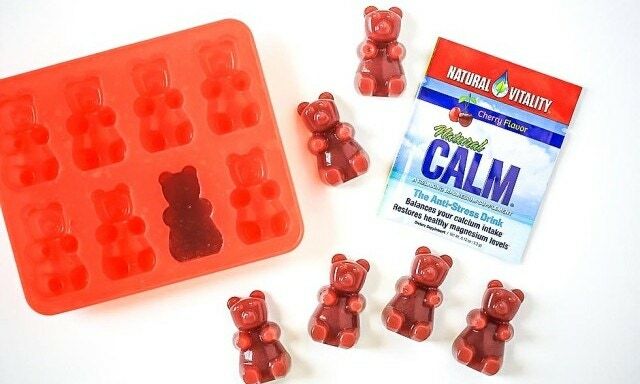 Eat 2–3 gummies to get your daily dose of Natural Calm. Pour the juice into a bowl and sprinkle the agar powder across the top of the juice. Let it sit without stirring it for about 5 minutes. Stir the juice—the liquid should have thickened slightly. Pour all of the juice mixture into a saucepan and turn on high heat. Add the Natural Calm powder and optional honey. Stir together. Allow the mixture to come to a boil. Stir for 1 minute, then remove from heat. The mixture should have a consistency of syrup. Continue to stir the mixture until it cools off a bit (about 2 minutes), and then pour it into the molds. Note: Do not let it cool for too long without stirring it, as it will get thick and lumpy. Place the molds into the refrigerator for about 2 hours or until all the gummies are solid. Pop the gummy bears out and enjoy! If you’d like green gummy bears, try adding a green juice with spinach and kale. Our inspiration for this recipe came from health coach Kelley Suggs. Check out her interview with Twin Cities Live to learn more about the benefits of magnesium.